Anyone who knows me understands that I enjoy antique shopping. It's often furniture that most people associate with antiques, and I admit that I am constantly on the lookout for new pieces. But in addition to all of the items you might find to decorate your home, there is an incredible variety of glassware and miscellaneous bar tools to uncover. You won't always find bargain prices, but you can find unique items. My wife and I especially enjoy hitting weekend estate sales and seasonal antique shows, but any shop or showroom of dealers can yield treasures. So, what does this have to do with ice? In our last Drink Of The Week we poured our cocktail over crushed ice and I mentioned that I crush mine by hand. I thought I would share some of the tools I use for this and hopefully inspire you look for cocktails that will let you do the same. A few weeks ago I was walking through an antique show looking at "primatives" when my wife spotted a turned piece of maple that was just what I needed. A week or so beforehand, she had given me a Lewis Bag. This simple device is basically a thick, natural canvas bag that is used to make crushed ice. First, you take regular ice cubes and place them inside the bag. 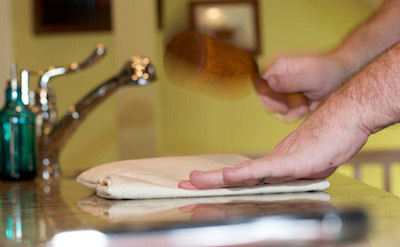 Then, lay the bag on your counter or bar, fold over the open end and hold it shut with your hand. Finally, take a blunt instrument (my antique piece of maple) and pound the bag of ice! The more you pound, the finer the crushed particles. When you think you have reduced the cubes to evenly crushed pieces, stop pounding and open the bag. When you do, you will notice something interesting is going on. The ice is dry. This why I love using the Lewis Bag. The canvas wicks away moisture as you crush the ice. This results in colder ice pieces that are less apt to water down your drink. Use the ice immediately. Remember, crushed ice can quickly cool a drink, but it also melts faster than large chunks. The Lewis Bag is available from a few online retailers. You can also search for Tag Bag which is how mine is labeled. Or, just make your own using natural (not dyed) soft, thick canvas and the appropriate sewing techniques. It will have to be strong since you'll be pounding through it and you'll obviously need a mallet of some kind. You could look for something similar to the one Chris McMillan used when he made his famous Mint Juleps at the Ritz-Carlton Library Lounge. Or, do what I did, and find the appropriate tool at an antique sale. Some people simply use the handle of their muddler. Pounding ice cubes into submission isn't for everyone. Alternatives to this method involve more mechanical techniques. First, there are large capacity ice crushing machines. These are great for parties and situations where you need a lot of ice crushed quickly. You pour cubes into a hopper and flip the switch. An electric motor turns a hidden mechanism and the machine "eats" the ice and delivers a stream of crushed pieces into a collection bin. 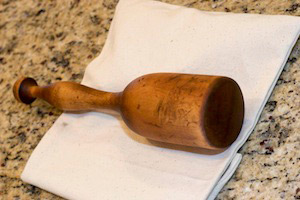 A good blender might work, but rapid blade action creates friction and heat and that can cause the ice to melt and get stuck around the walls of the pitcher. Another option is the hand-cranked machine. These can be found occasionally at antique shops, but I own the Swing-A-Way Ice Crusher. It has a good-sized hopper, a great suction bottom that really works, and a crank that is easy to turn without banging your knuckles. I like these because they can be used in small spaces almost anywhere (Mai Tais on the pontoon boat, anyone?). You can get decent cracked ice by rapping a cube in your hand with the back of a bar spoon—but that's not the same thing as crushed. It's hard to get uniform reduction of ice particles without some kind of tool made for the purpose. I should probably mention that crushed ice isn't appropriate for every cocktail. In fact, it can easily ruin the balance of dilution in many drinks. Knowing when to use crushed ice isn't really a mystery, but the proper use of any ice is important. A cocktail will typically call for crushed in it's recipe when appropriate, and it will be proportioned to take into account the higher dilution rate. Drinks such as the Mai Tai or the Mint Julep are good examples. Whether it's the perfect cocktail glass, a vintage shaker or an unusual piece of wood, the items you find at an antique sale can surprise you. Sometimes you'll find a much-needed tool and other times you'll come home home with deco bar products of yesteryear. Let me know if you find anything. . . cool.